The National Policy Institute is a non-profit think tank that has been designated as a hate group by the SPLC. 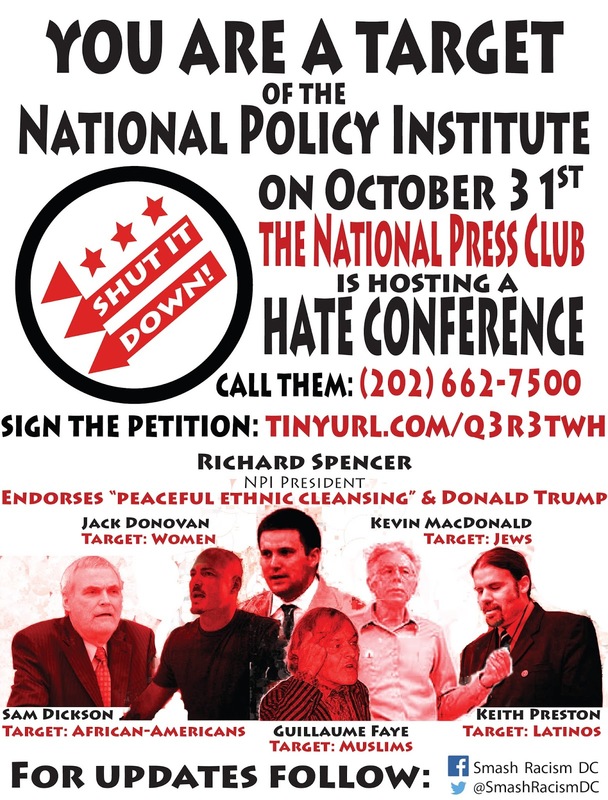 They are hosting a day-long conference at the National Press Club to push their bigoted views to justify their advocacy of "peaceful ethnic cleansing." This includes things like explicitly racist immigration quotas, restrictive voting laws, re-segregation of schools, historically and scientifically inaccurate school curricula, and repeal of the Civil Rights and Equal Employment Opportunity Acts. I've written a review of this year's conference that provides a history of the National Policy Institute as well as brief descriptions of the views of the speakers in the flier above. While this group may seem fringe, they are part of a cadre of suit-and-tie neo-Nazi organizations that have become increasingly influential in mainstream politics. Please take a half a minute to sign the petition to shut them down.